CRO Hacks #11 to #20 conversion rate optimization hacks that will improve your sites conversion rate and provide user insights about your site and busines. I have successfully used most of these CRO hacks for clients on landing pages, ecommerce or across a whole site. 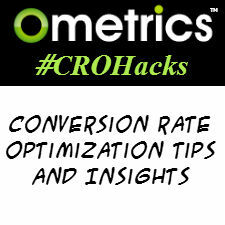 If you have a CRO Hack add it to the comments below or send it to me with your name and twitter handle for credit to greg@ometrics.com. CROHack 11 – Increase ad ROI with exit popups. Offer a white paper, eNewsletter, coupon, etc. Email lists can grow 500% or more with this technique. CROHack 12 – Test the color of your CTA button. It is the contrast that counts. Can’t say enough about this one. CROHack 13 -Test the shape of your CTA button. Make it stand out from the other shapes on your page. CROHack 14 – Use a light shade and a line around your credit card entry section. Provides perceived security. Putting a security icon in the shaded areas also improves check out completions. CROHack 15 – Bold “Add Coupons” in your checkout. Bold with a contrasting color. Make sure you read your data carefully. You may see more orders but lower profit if this is not done right. You may see less cart completions as users go off and look for coupon. CROHack 16 – Provide a link to a list of coupon codes next to the enter coupon box in checkout. Customers want to feel that they are getting the best deal. This also stops users from leaving the site to find a coupon. CROHack 17 – Call coupons codes reward codes. Makes customers feel special, coupons do not make users feel good if they do not have one. CROHack 18 – Once in the funnel keep them there. Reduce links to escape a funnel, use funnel metrics to discover where the leak is. CROHack 19 – Add information users seek in the funnel. Once you discover what page users are leaving your funnel and where they are going remove those links and add the information on that page. CROHack 20 – Have people on your landing page look at your CTA or Form. As humans we can not help but look where others are looking. I have seen huge lifts from this one tactic. Greg Ahern Founder and President of Ometrics® is a fanatic about conversion rate optimization, AI chatbots and lead generation. Greg has been a successful Internet entrepreneur since 1994. He speaks at conferences and webinars and has built a number of internet businesses, including web marketing, web development and internet lead generation, which have been successfully acquired. Greg is the Denver Chapter Leader for the Digital Analytics Association. You can follow Greg on Twitter @gregahern and join his CRO Hacks Groups on Facebook and Slack.